LETS SEPARATE JOE BIDEN THE CANDIDATE FROM THE MEME . . . NOW » how's your morale? Joe Biden. Uncle Joe. The President of Vice. Leslie Knope’s number one crush. Obama’s bromantic partner. 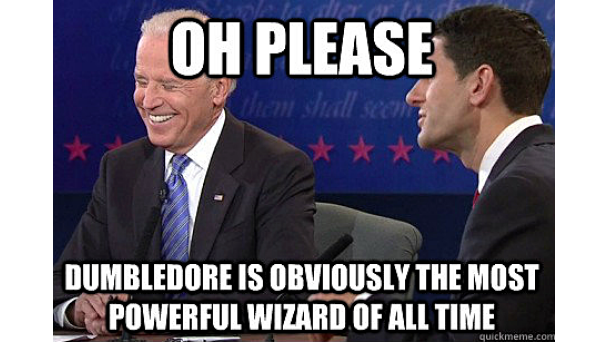 The internet loves Joe Biden. This is in no small part due to what is arguably one of The Onion’s funniest ongoing character sketches. Rather than post exaggerated versions of actual headlines (like they do with Trump) or juxtapose mundane or silly situations with a serious character (like they largely did with Obama) they created a whole alternate personality and timeline for Biden. And on some level, it seems to have stuck in the American consciousness; albeit a slightly cleaned up version. A lot of those headlines were pretty dirty. That said, they drew up that alter ego because Biden does, in fact, seem like a pretty cool dude. Like a Vice President who really wouldn’t mind that you called him a “dude.” (Think about that with Gore, Cheney, or Pence.) From there, the image of Biden just like, hanging out with Barack Obama and making jokes has become a pretty ubiquitous politics meme that’s actually pretty apolitical. Joe Biden is a career politician. This isn’t a smear; it’s a fact. He was a Senator from Delaware for thirty six years before he was Vice President for eight. A lot of people bandy “career politician” around like it’s an insult or something damning. It shouldn’t be; presumably it means that you’ve done a good job serving your constituents and that’s why they keep voting you in. It can sometimes lead to cultural disconnect, or inertia on policy, but I don’t see it as the insult that many do. Joe Biden has run for President before. And frankly, he’s not that great at it. At least not at the Primary level, which is where you figure out whether someone can mobilize a base of voters. He lost to Michael Dukakis in 1988, and Dukakis went down in history as a premium example of bad campaigning and embarrassing Democratic loss. Some of Biden’s loss in that primary is due to scandals that were a lot fresher in 1988 than they are now, but you know folks will bring up his plagiarizing incident in law school, and then Trump would bring that up again in the General. In 2008 he was one of a similarly crowded field before being picked for the ticket by Obama. He’s always been politically ambitious– you have to be to stay in politics for so many years– and 2020 will be his last chance. Joe Biden is a moderate. This, once again, isn’t a knock. It’ll be up to the primary voters (which should include you) to decide if a moderate, progressive, or someone who juggles their stances depending on the issues should be our candidate. But Joe Biden, while definitely feisty with Trump, has always been someone who prides himself on his bi-partisanship, and ability to work the middle lane on a variety of issues. There’s a lot here to get into, but you’ve got google. Most famously, he opposed the mission to kill Osama Bin Laden, a stance he’s since disavowed. He also came out in favor of marriage equality at a time when that was still a huge political question mark for Obama. While socially noble and historically vindicated, it still put his boss in a weird bind, one that a president with less grace and decorum (which is to say most of them) probably would have been pretty irritated about. Undercutting Barack Obama isn’t something I think should be held against Biden, but it does demonstrate that yeah, this isn’t just lovable Uncle Joe up there; he’s a canny political operator. This will attract many people, as well as alienate some. His personal views on reproductive rights reflect that, though his political ones are tied to the Democratic party’s. I don’t have a strong opinion on whether or not Biden should run. Much has already been written about what a Biden candidacy would both look like and “mean” for the Democrats, with a much higher word count sure to come. While I think younger, newer leadership could bring real energy to 2020, I also recognize that a marquee moderate could square away some of the states that have been difficult for Democrats electorally. We’ll see as the field emerges who will be right to take on Trump. But with such internettable personalities, it’s important to remember who you’re actually considering, not just their memes.